Many homeowners face the dilemma of having a smaller bathroom for their guests. When hosting family or friends, we want our home to feel warm and inviting and often, a smaller guest bathroom can feel, well... claustrophobic. Fear not! There are creative ways to make your guest bathroom look and feel larger without a complete remodeling. With some creative design techniques, you can take the guest bathroom from claustrophobic, to feeling cozy and intimate. Depending on your decorating style, it can be quiet and sophisticated, charming and intimate, or even sparkling like a jewel! No matter how you decorate, a small guest bathroom though, unless you remodel and make the physical space larger, it will always be a small bath. However, with some visual magic, some color changes, and the proper lighting, you can transform it into a welcoming retreat for your guests. While the bathroom is a unique space in the home, the same theories, techniques, and strategies for creating the illusion of space apply here, just like any other room in the house. Follow these decorating tips and you'll make your bathroom look and feel larger, without taking down the walls and remodeling! Pale soft colors give the illusion of more space. Neutrals like cream, whites, light grays and pastel tones can reflect light and add a serene sense of space. Try to avoid, strong, bold, exciting colors on walls, but feel free to add them to accessories like towels and window treatments. In a small space, proper lighting is essential. Consider proportional wall sconces mounted at eye level next to the mirror and cove lighting installed behind the mirror to create the proper ambiance. If the bathroom is small or has low ceilings skip the overhead lighting. If you have the budget, skylights, Solatubes, or larger windows can bring in light without taking up valuable real estate. While a standard vanity provides additional storage in a small bath, it can take up a lot of floor space and make the room appear smaller. If you have adequate storage consider replacing your vanity with a pedestal sink. This is an inexpensive fix that can make your bathroom feel more open. If you need the storage space, a floating vanity can give the illusion of more floor space and provide the storage you need. If there's one element in a small bathroom that can create the illusion of space and set the aesthetic tone of the room, it's a big beautiful mirror. You might think that a small mirror will enlarge the space, but in fact, the opposite is true. Installing a large mirror over the sink will make the space feel more open. 5 - Use A Single Tile For The Entire Floor Space, Including The Shower! Covering the entire bathroom floor with a single tile is a great way to trick the eye into seeing a larger space. Using different patterns and tones for your tile can make a space feel smaller and crowded. Installing a threshold-free shower and continuing the floor tile into the shower space can give the illusion of a much larger space. Plus a threshold-free shower is a great universal design element that is safer for older guests and family members. Most bathrooms have space behind the walls and a great way to give the illusion of a larger bathroom is to open the wall and create inset shelving. By painting the shelves the same color as the walls they will appear seamless and give the illusion of a larger space. A neat, clean, put-together bathroom will always look larger than a cluttered one! Have only the most essential elements visible and put everything else away. Take a little time to organize your linen cabinet and vanity to make the most of the space you do have. When remodeling, plan your space needs for storage containers– ideal for small items like Q-Tips and flexible height shelving in your vanities cabinetry for frequently used items like paper towels. 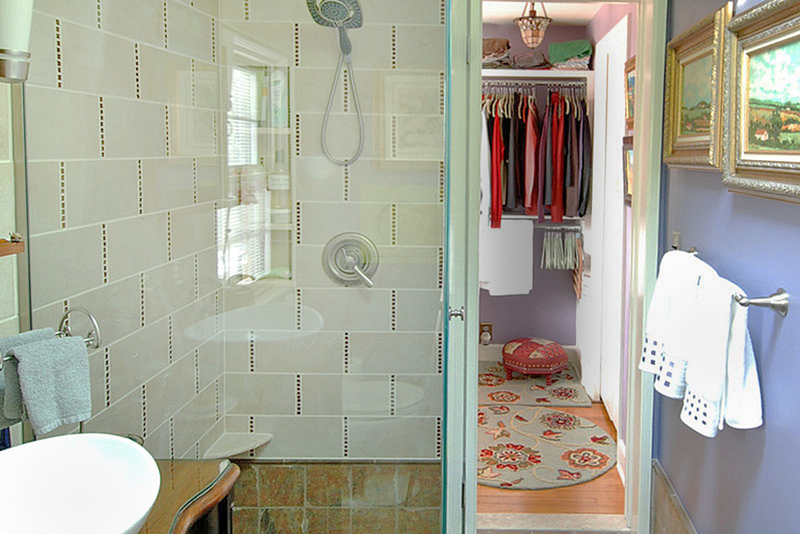 These seven tips can help make your small guest bathroom appear larger and more inviting. Just because you have a small space, doesn't mean that it has to be boring, or claustrophobic. With a little work, some creative thinking and some classic design techniques you can turn your small guest bathroom into a warm, inviting space for your guests, and show off your sense of design, color, and style!